A soft, balanced and medium-bodied blend. Its aroma and delicate acidity meld together in a balance of sensations characterised by notes of hazelnut and dried fruit.This coffee is best served as a 15-35ml espresso or wit..
100% arabica coffee. 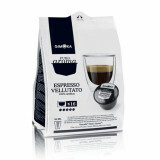 A rich and aromatic Colombian blend of Arabica beans, medium roasted to best express its full taste. Colombian coffee is a source of superior quality that combines the fruity acidity, swe..
A blend with a delicate flavour and refined acidity characterised by a flowery aroma and a thick crema. The aftertaste is pleasant and balanced. Gimoka Puro Aroma capsules for Dolce Gusto® system 100% Made in Italy..
A blend with a strong and persistent flavour and intense aroma. The hazelnut-coloured crema is full-bodied with a delicate hint of acidity and an aftertaste with notes of almond and dried fruit.This coffee is best se..
Intenso is a blend with an intense, distinctive and captivating flavour, ideal for people moments in the day when you need just the right dose of energy. 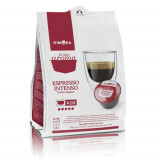 Gimoka Puro Aroma capsules for Dolce Gusto® system 100% Made..